Jennifer M. Houti « James McElroy & Diehl, P.A. 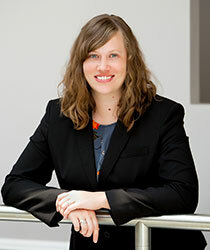 Originally from Greenville, South Carolina, Jennifer Houti received a Bachelor of Arts in political science and Spanish from the University of South Carolina’s Honor College. Jennifer went on to earn her Juris Doctor and an L.L.M. in international and comparative law from Duke University School of Law. After law school, Jennifer began her practice as an associate at a law firm in New York, NY. Since joining James, McElroy & Diehl, Jennifer has focused her practice on civil litigation. JM&D Welcomes Two New Associates. John currently represents contractors and owners in complex construction disputes, often dealing with complicated surety issues.